This one is interesting to me. I pull these out of my deck box at random, and then start writing. But just this last week, I’ve been musing a lot on how blessed I am to have a wonderful wife to whom I am sealed for time and all eternity. We were married in 1987 in August (so our anniversary is coming up). We’ve had a wonderfully rocky marriage, especially the first three to five years. There were many times when we were working things out that we were each very upset at each other. And yet, at no time did I ever consider divorce as an option. As we’ve talked, she’s expressed this as well. We were committed to the idea of being committed to each other. We had promised ourselves to each other for eternity, so that meant we had to work out the problems we were facing. Well, as we did that, it kept getting better and better. Now, we’re looking at our 28th coming up next month! 28 years together! I can’t imagine life without her. 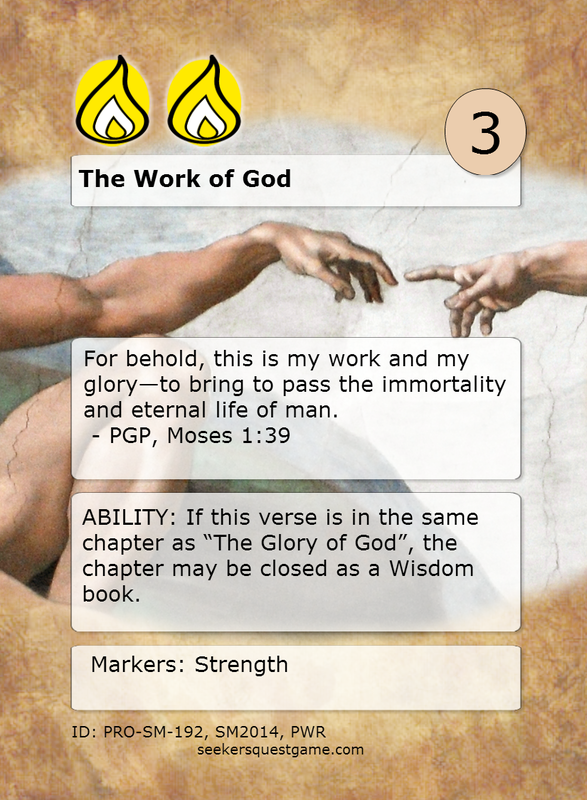 This verse card has a very stunning graphic, I think. I tried to capture the thought of something being both earthly and heavenly at the same time. This arc shot of earth from space fit the bill very nicely, I thought! Thanks so much, Jodi, for all these terrific years! 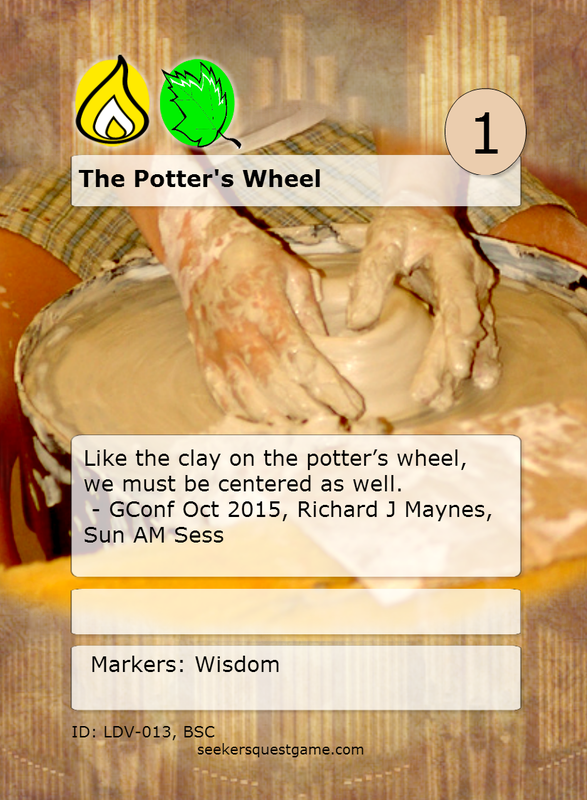 Verse Rule: EFFECT: Exchange a chosen verse in one of your personal chapters with a chosen verse in your discard (its abilities are applied). This verse, in its context in the New Testament, is teaching us about the Resurrection. It talks about how we all, being corrupt and mortal, will rise again, resurrected, perfected, and immortal. This whole chapter talks about the reality and universality of the gift of the Resurrection. Verse 55: "O death, where is thy sting? O grave, where is thy victory?" 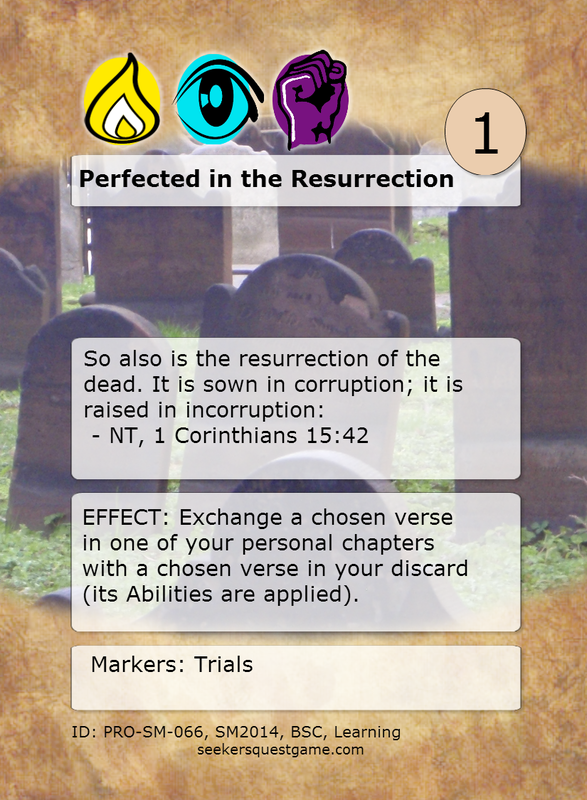 In the game, I worked the verse rule so that you could "resurrect" a verse and swap it out for another verse in your tabletop. The abilities of the verse thus brought forth are then applied. This is particularly cool if there's a combo you've got going and you need a verse from your discard to trigger it. Maybe you've already done the combo, closed the book, and now you want to do it again in another chapter. 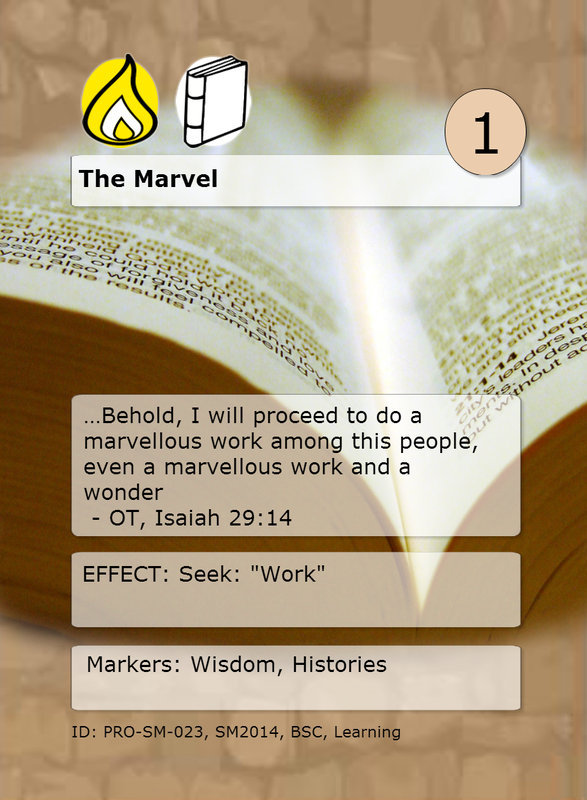 For example, what if you've got The Work of God and The Glory of God in a chapter. You close it up and receive your blessings. 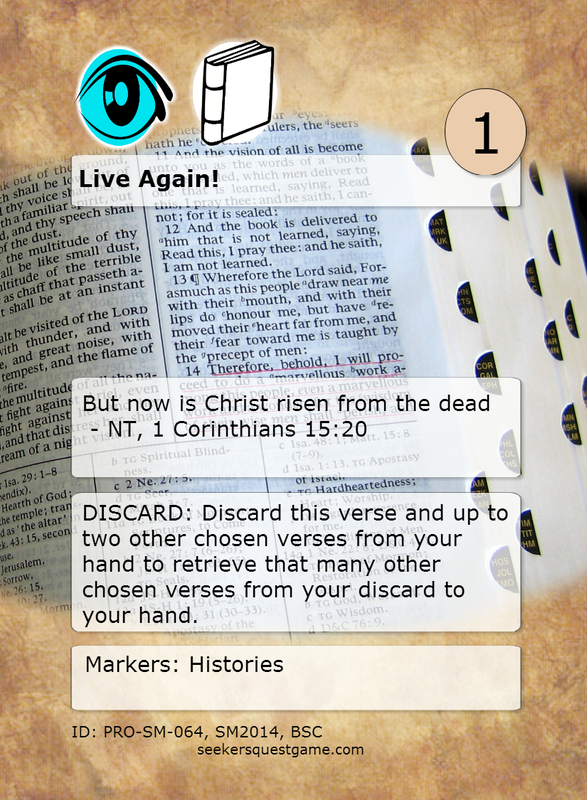 But now those two key verses are in your discard. If you get another copy of one of them in your hand, you can use Perfected in the Resurrection to swap it out from the graveyard and there you have another quick book! 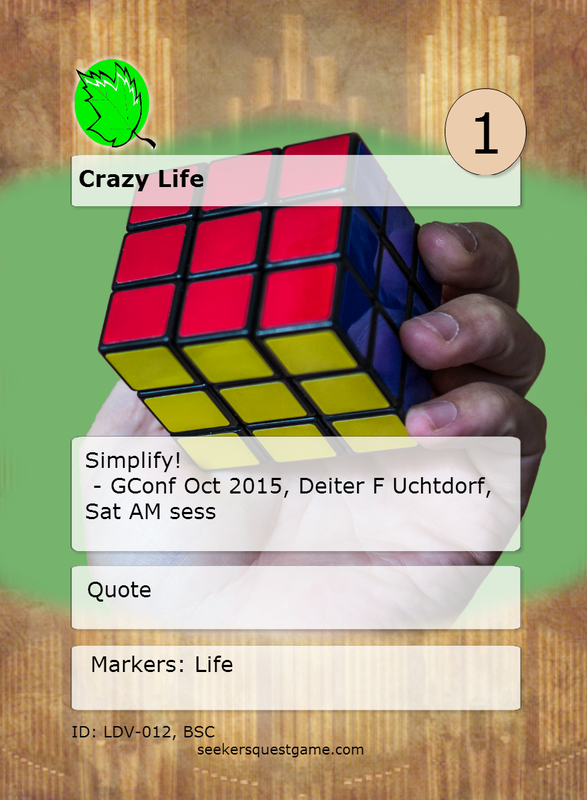 In addition to this, It's quite flexible with its icons, and it's only a 1-sac cost to play it. Quite a useful card! 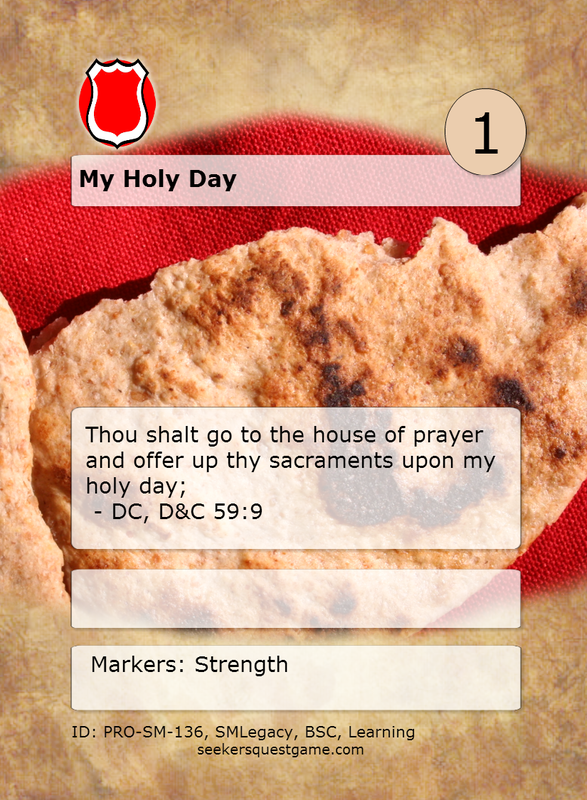 Card of the week: Who Wants You to Pray? While I was on my mission, I had a very powerful spiritual experience that started with a prayer. It’s not really the right place for me to go into detail here, but suffice to say that this experience really helped me to see the power of the priesthood and the gospel in a much purer light. It was such a profound experience for me that I even wondered for a time if it was from God. Then, I found this verse. I realized that this experience had encouraged me to pray more and more, and the prepare myself more deeply when I prayed. Clearly, it had to have come from God. There was no other source. It was a great feeling to have it resolved. When this verse came up in the Scripture Mastery list, it made me smile to remember that experience. I thought that it was all about trials and about overcoming them. It’s all about praying through your adversity. 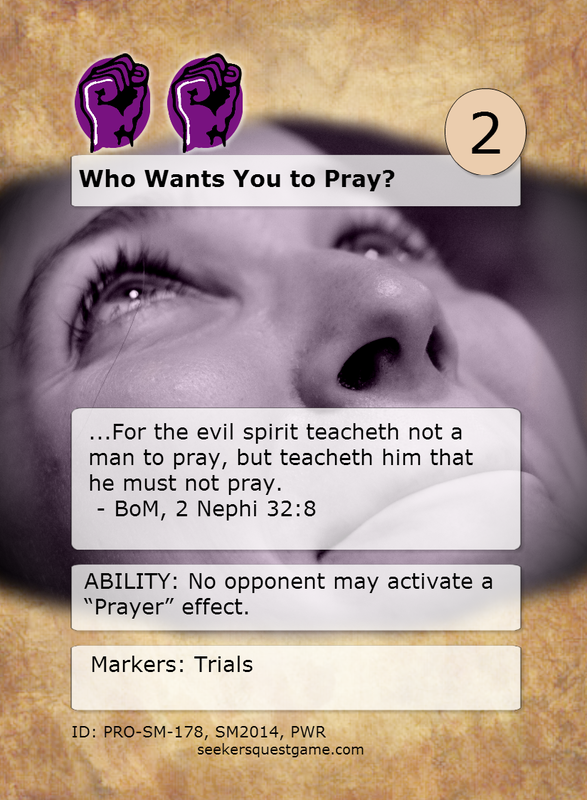 The verse rule makes some players overcome the verse and work to eliminate the block so as to be able to benefit from the prayer effect again. 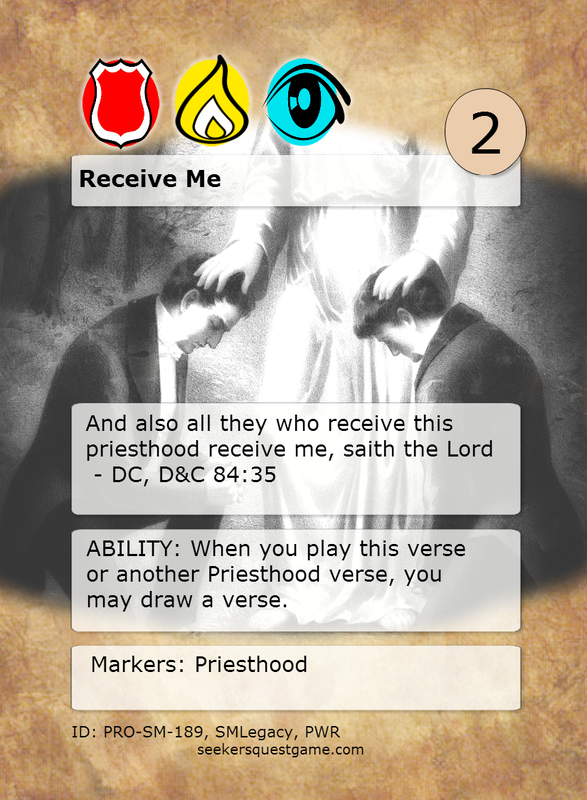 This verse would be really effective against a deck that relies on the prayer mechanic to gather the right cards for a winning combo. Verse Rule: ABILITY: If this verse is in the same chapter as “The Glory of God”, the chapter may be closed as a Wisdom Book. We are literally the spirit children of a great and loving God. I believe that to my core. And just like I want the best for my kids, He wants the best for His. And just like I should dedicate my life and work for the betterment of my own children, so has He. So, this father’s day, I want to share one of my favorite verses, and one of my favorite combos. In fact, I based a whole deck on this combo. The combo itself is, of course, obvious. 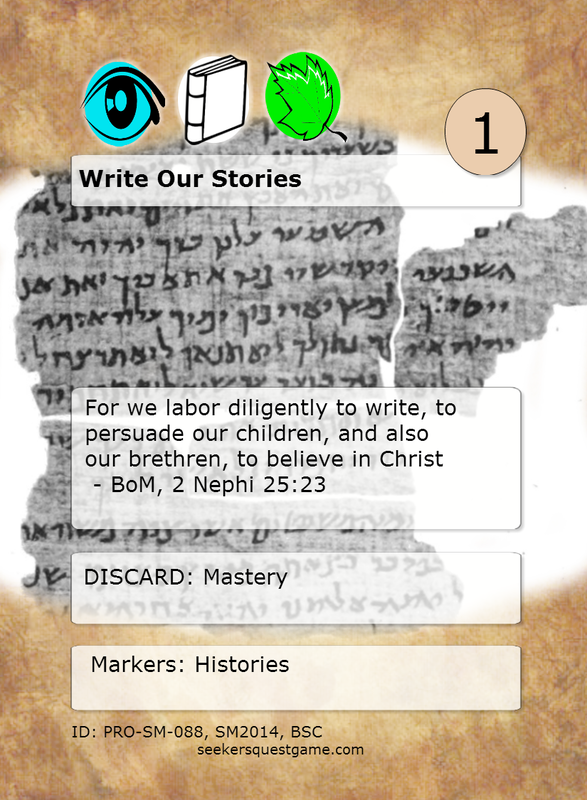 You play “The Work of God”, and then you play “The Glory of God into the same chapter. Ba-boom. Quick and easy two blessings. Where it gets crazy is when you build a deck around it. Here’s how it works: First, you have three copies of each of these main cards in the deck. Then, you have other verses that can fetch these two directly, like verses with “Keyword: Man/Men” or “Keyword: Eternal”. Put three copies of each of those in your deck. Maybe even a few “Judgement Day”s to fetch the two back from the discard after you’ve used them. 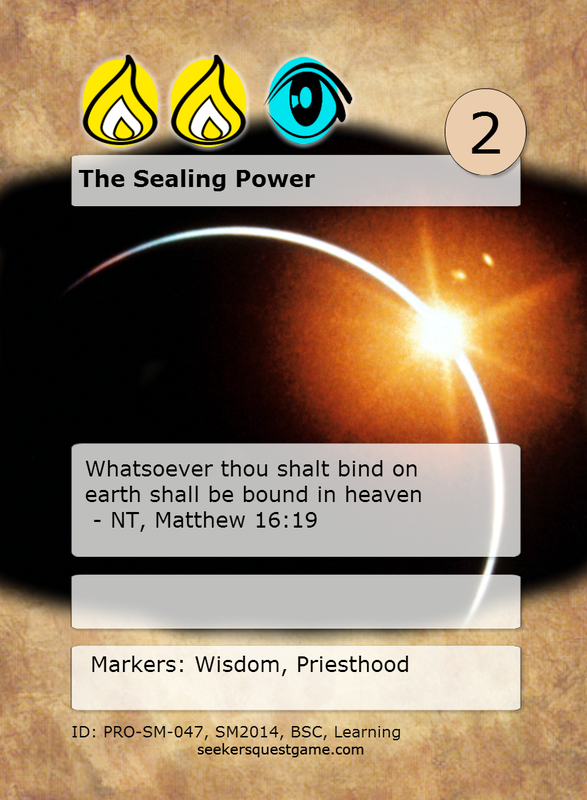 Finally, load your deck with higher-value Prayer Effect verses. 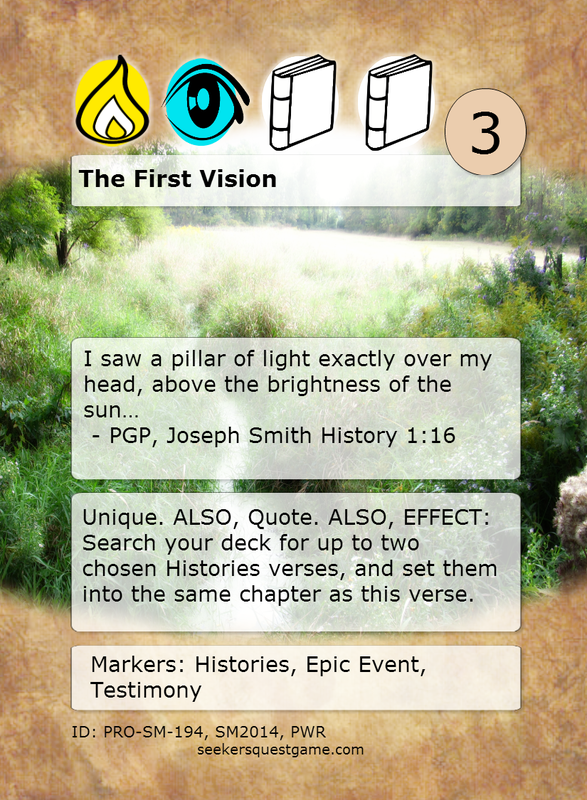 These will help you cycle through your deck more quickly and get to these two verses. 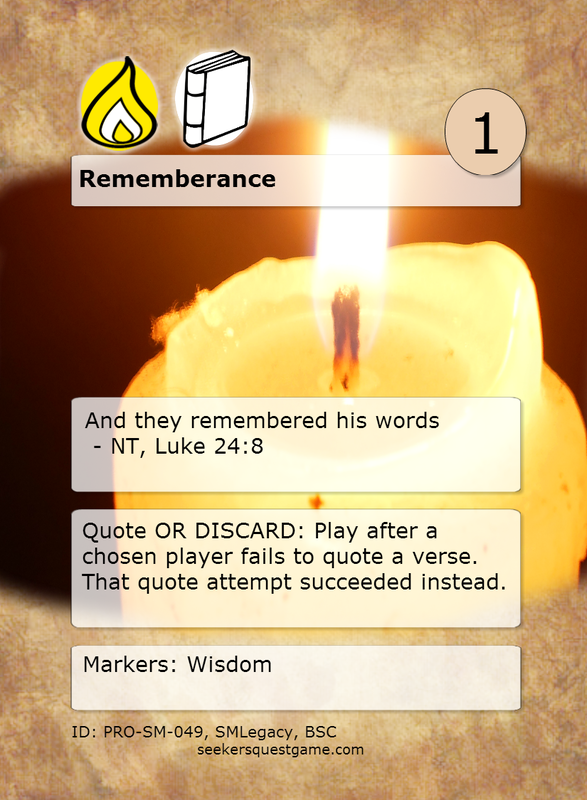 Then, add some simple 1-drop verses that you can either play into chapters your opponents are building, or use as sacrificial fodder to play the two big ones.